Colonel Schwanbeck was born May 16, 1912 at Humboldt, Arizona. He graduated from Ash Fork High School, then earned his BA degree in education from Arizona State Teachers College. Schwanbeck enlisted in the Air Corps in 1934. After completing flight training in 1936, he was commissioned a 2nd Lieutenant. Schwanbeck was first assigned with the famous 2nd Bomb Group at Langley Field, Virginia. He later was transferred to the 19th Bomb Group at March Field, California. He moved with the 19th Bomb Group to the Philippines in October of 1941. Returning to the United States in 1942, Schwanbeck was assigned to the West Coast Training Command at Albuquerque, New Mexico. Schwanbeck commanded the 99th Bomb Group from January of 1945 through the end of the war in Europe. 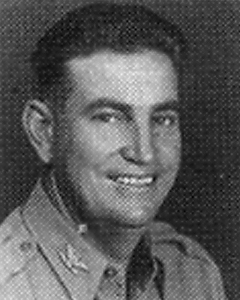 Returning to the U.S. in 1945, he was placed in command of Peterson Field, Colorado. After completing the Command and Staff school at Maxwell Field, Alabama in 1947, Schwanbeck served as SAC HQ commander in Washington D.C. Schwanbeck was a professor of air science at Fordham University in New York City from 1954 to 1957. From 1957 to 1961, he served as the director of flight facilities at Tinker Air Force Base, Oklahoma. After retiring from the Air Force, Schwanbeck worked in the parole and probation office at the Arizona Department of Corrections from 1964 to 1975. He was inducted into the Arizona Aviation Hall of Fame on April 21, 2001. Schwanbeck passed away on May 3, 2001 in Phoenix, Arizona.